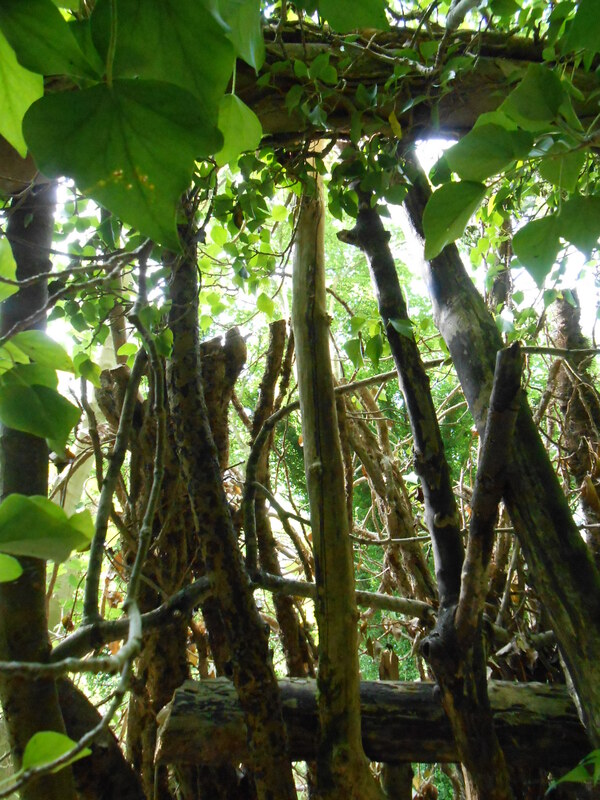 I don’t think children build secret hideouts like that as much these days (not in the UK anyway), so it was lovely to stumble upon such a place. When I was a child (now I’m sounding old), I’d be off outside all day in the summer holidays, in the fields and woods, with no adult supervision. Now parents are frightened to let their children out of their sight because of all the ghastly stuff they see in the News. How about children where you live, Sylvia? It looks so idyllic. I hope they are let off the leash to go exploring on all those beautiful beaches. I definitely would have made a “club(house)” out of that group of trees, back in the “olden” days when I was a child! There’s been quite a bit of talk in the U.S. about the deficit of nature and overall outside-time for children (on NPR just last weekend, on the TED Talks Hour, I think, they mentioned a summer camp geared toward letting children be more independent and getting out in nature and using “dangerous” things like saws, fire, and so forth). I must admit, even here in a (very) small town, I’m sometimes a helicopter mom, at least for the youngest (who’s not yet school age), whereas people of my generation and earlier, who weren’t required to be child laborers (after that era, thankfully), were more involved with the environment, more active, and more playful overall. It’s a sad commentary on society, really, and Western cultures really (with the U.S.’ gun violence at the level it is and the sometimes really violent and/or child-related crimes). I could go on about this, but I’ll spare you, Sarah. Thanks for the refreshing haiku and picture, regardless of all that. Sorry, I was attempting to reply to your comment on my mobile and pressed send by mistake before I’d finished saying that too much overprotection ultimately puts children in greater peril. I agree. I’ve gotta find that good balance of independence and explorativeness versus safety that works for the kids. I never had a brother, so my son is kind of more difficult, probably, for me to figure out, although I was the “tomboy” of the family. After two attempts to post a proper reply to you from my mobile, Leigh, I’m finally at my PC, which is more suited to my large hands. The first reply disappeared, which meant the second one that got posted didn’t make sense. Anyway, thank you for your very thoughtful reply. A sad commentary on society it might be, but it needs saying and is worthy of many rants by people who want something done about a situation that stunts an essential part of children’s development, leaving them demoralised, dumbed down, unimaginative, hooked on being entertained rather than making their own entertainment, frightened or angry at the world, paranoid, stressed, and lacking in basic survival skills should some cataclysmic event remove technology from them. There, I’ve had my rant. I think we’re in accord about this. Glad you found my haiku and picture refreshing. I love those olden days!! We actually used our imaginations!! Great shot Sarah! Yes, I think that a lot of children are hooked on being constantly entertained rather than creating their own entertainment these days. I’m thrilled that my grandchildren are following in the family tradition of eccentricity combined with huge imaginations!